The tram outside the Forresters where it began its journey. The present day bus stop is approximately where the boy is standing by the wall [XSSP038]. 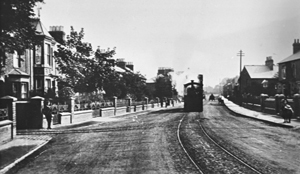 The tram making its way along Wolverton Road. Note the absence of other traffic and on road clutter. Note also the decorative railing on the top of the wall [XSSP028]. 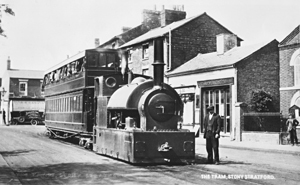 A Stony Stratford resident, Cecil Palmer, remembers the tram service between Stony Stratford and Wolverton. “There used to be a stop at King St, then it didn’t stop again until it got to the Print Works – only when it couldn’t get up the hill, when we had to get out and push: Snow or anything on the line would stop it. The road in those days was twisty and turning to Wolverton and it was only when they took the metals up that they straightened it. “Some men could afford bikes but most never got enough money to buy them. A bike cost pounds – the cheapest bike after the First World War was £2 or £3 which was more than a week’s wages.